Unlocking the "superpower of the 21st century"
This definition sounds good, if we ignore that all Internet companies are running after just one thing: our attention. Emails, SMS, Twitter, Facebook, smartphone notifications. All of those interruption sources brings us further away from deep work. The problem is our success, as a knowledge worker, depends on our capacity to learn complex subject and stay competitive. For that, we need to regain familiarity with deep work. Cal Newport chooses to divide his book in two parts to pursue two different goals. The first is to convince you that the ability to perform deep work is becoming increasingly rare at the same time it is becoming increasingly valuable in our economy. The second is to train your brain and transform your work habits to place deep work at the core of your professional life. The first part is persuasive and very well-written, even if I deplore not enough scientific studies to further support the author’s arguments. To complement, the author resorts on common-sense and celebrities like Bill Gates and JK Rowling. This part totally convinced me of the importance of deep work and I predict an increasing number of publications or books on the subject in the years to come. 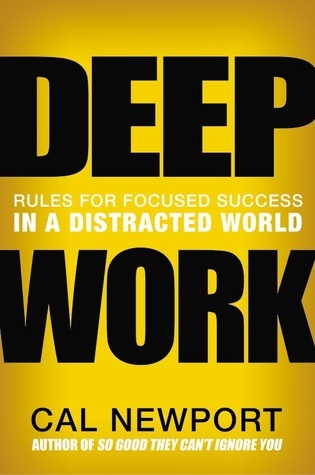 The second part reflects the author’s practices to implement deep work into your life using 4 basic rules (“Work Deeply” by adjusting your schedule, “Embrace Boredom” by fighting the urge of distractions, “Quit Social Media” by learning to use them at your advantage, “Drain the shallows” by tracking every occurrence). The guidelines are not exhaustive and will require some adjustments to fit your worklife, but they help get started without delay. One of them that particularly challenges me is the importance of quantifying the depth of every activity: “How long would it take to train a fresh college graduate to complete this task?” Only a few months is a sign you are not doing deep work, not the kind of work that will ensure you a long professional life. Of course, not all tasks have to be deep work but just evaluating them in the light of deep work has had a profound impact on me. In definitive, Deep Work challenge us to regain our attention back on subjects to matter the most to us. Every knowledge worker should obviously read this book, but every parent of teenagers probably deserves a copy too.